NEVER AGAIN, WAGER. NEVER AGAIN! I hope that that’s an outdoor shot. 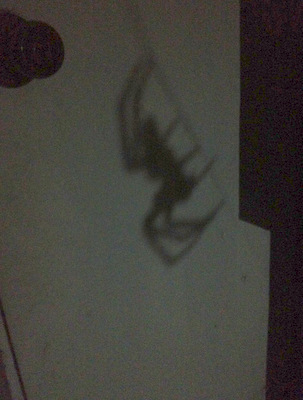 That’s a black widow shadow if ever I’ve seen one. Sorry, Scotty, but I just couldn’t resist. It *is* an outdoor shot, and it wasn’t a black widow. I have a photo of the actual spider as proof. I’ll refrain from posting it. The degree to which I have become habituated to spiders in my house is itself alarming. There’s one that hangs out between the coffee maker and the compost bowl, one above the toilet, and a scampy little guy that crisscrosses the living room and attracts attention from the scaredy cat. And the patio is half surrendered. Mrs. K-sky at least still has the presence of mind to splat the occasional black widow. The black widows are in the compost bin.